The Utopia exhibit is coming together! 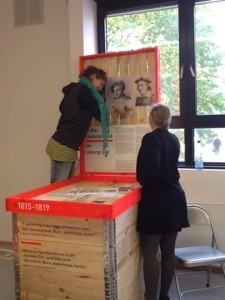 The team spends many hours installing it here in Giessen in this first venue. The press and the radio are very interested, and the team puts in long hours and works very hard. It will open in the new cultural hall (former City Library) on November 1st. It will be here until the end of the year. It will go up again in Bremen, Germany in April until July. Then, following the original route, it crosses the ocean and opens in September, and is on exhibit in the German American Heritage Museum, in Washington, D.C., through October. It’s final destination is St. Louis, Missouri, where it will open on November 22, 2014 in the Missouri History Museum. While the exhibit is open here in Giessen, there are many exciting talks, programs and films that go along. 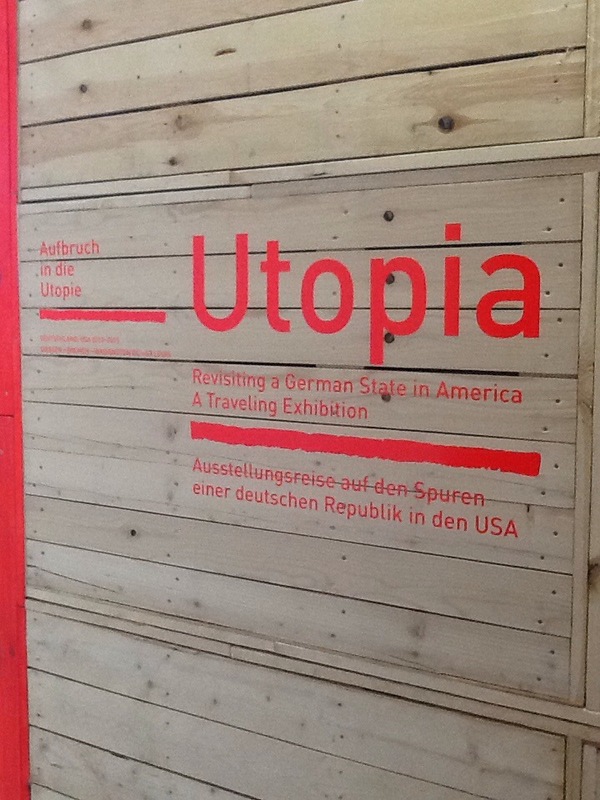 One will be able sign up for one’s own “test” of emigration, or leave one’s own thoughts on what they consider a Utopia to be, or visit its archives, and read the thousands of documents, maps, books and such, that the Traveling Summer Republic uses to create the exhibit, and produce the accompanying book, Utopia. Everyone has their own vision of Utopia! In 1834, Friedrich Muench and Paul Follenius were joined by hundreds from Germany, to build theirs in America, in Missouri. Years later, the pastor at Muench’s church would write “he has gone to his Utopia”. What is yours? Their dream was to build a German State, and instead helped Missouri become a State that is truly “German” even today.